The troubles started last week. Someone broke the toilet seat. I didn’t do it, and Herself claims she didn’t do it. Sandy isn’t heavy enough so we are blaming Minnie Pig. Actually, I do vaguely remember a strange cracking noise last Tuesday night after that lock-in down the pub, but my memory is a bit hazy about the whole night so I may be mistaken. Anyway, the seat has had a big split in it, which could act as a rather nasty vice and could clamp the arse of anyone who sits on it. I don’t know how Herself has been managing, but for the last week or so, I have been – how shall we say? – abstaining. The Accidental Terrorist was passing by the hardware store in town this morning and he bought a new seat. It’s quite fancy. It’s wooden though it doesn’t seem to have any splinters in it. Yet. I have just fixed it on. It has been annoying me for a week now. I have been dying to get it fixed. 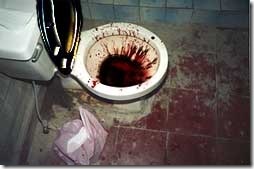 GD how in the hell did you get a photograft of my toilet. Oh Jeeeezus!! You should seriously consider having a colonoscopy! Popeye – We have similar toilets? Did yours crack too? JackMcMad – No thanks. I think I just had Colonic Irrigation? Kate – That makes a change? Good Grief! It’s almost christmas; not halloween! Glad you clean it before taking the picture. Robert – What the hell has Halloween got to do with it? Jim C – Two hours with a toothbrush! It was Hers. I hope she doesn’t mind? NaRocRoc – Sick? Moi? What are you on about? I’m as healthy as a horse. TheChrisD – I would imagine it was a weeks supply of pints and curries. That’s a grand mix for cleaning out the system. ps. that means TOO MUCH INFORMATION!!! I grew up with humble beginnings. My father was a plumber and his response would be “that is the smell of money”! You posted about poo? Gawd . . .I’m off to visit the ‘other fella’ If you get a chance hire a DVD called “Kenny” it’s a kack! How is it you can talk about a toilet while posting a photo like that and get all these comments? Are you magical? Brianf – You wouldn’t have me hold back now, would you? Cranky – If that’s the smell of money, I don’t want any. Baino – No I didn’t? I posted about fixing the bathroom facilities. Savannah – Welcome and thanks for your kind concern. I hope you find this site a bit cleaner than Bock’s? Ste – Welcome to you too. There is usually only one pub involved [there’s only one decent pub in the village], but there may have been twelve or so pints. I think one of them may have been a bit off? Paddy – I’m shocked! Of course I flushed. You don’t think I would be so uncouth as to photograph an unflushed toilet? healthy as a horse eh? Well then I reckon you need a stablehand with a shovel and a bucket behind you after you’ve dropped the kids to the pool!! It looks like Barney exploded over your toilet.